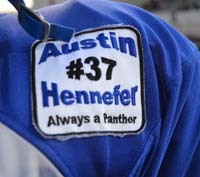 They wore their “throwback” jerseys from the 2010 state championship season—jerseys approved by the Idaho High School Activities Association that had a patch remembering young Austin Hennefer. Five Carey High School seniors marked their “Senior Night” before Friday’s Sawtooth Conference North eight-man football game against Camas County by remembering the young Panther football player who died at 15 in an auto accident on Oct. 26, 2010. Glen Andrews, Francisco Gamino, Patrick Baird, Gunner Thompson and Jordan Dilworth presented flowers to Dennis and Mary Ann Hennefer, Austin’s parents, and included them in the ceremony. Then Carey went out and built a 37-0 halftime lead—a number that coincidentally matched Hennefer’s jersey number—en route to a 45-0 triumph over the Mushers. It was the fourth straight win for Carey (5-2, 3-1 league) and ended its home season with a 4-1 mark on the Panther turf. Leading scorer Luis Garcia (12 TDs, 81 points) scored two touchdowns on 30-yard and 9-yard runs. Quarterback Dilworth tossed four TD passes to four different receivers—47 yards to Tori Alvarez, 15 yards to Baird, 15 yards to Nate Adamson and 35 yards to Christian Zarate. Dilworth added a 12-yard scoring run. Carey has won four straight by a 53-15 average margin since its 30-14 loss at Dietrich Sept. 14. The Panthers now finish their season on the road with games at Rockland (3-3) Friday, Oct. 19 at 4 p.m. and against upstart Clark County at Dubois on Friday, Oct. 26, also at 4 p.m. The outcome of the Clark County game will determine the Sawtooth North’s second qualifying team for the State 1A Division 2 playoffs starting the weekend of Nov. 2-3. Clark County (5-2, 2-1 league) is having an excellent turnaround season, averaging 36.3 ppg offense, after going 2-7 in 2011 including a 58-0 loss at Carey. Carey coach Lane Kirkland said, “Clark County came in here last year and hit us hard, just like Camas County did Friday, and we respect any team that does that. They have some good runners and it’s going to be a hard game for us. With a win against Clark County, Carey would qualify for the state playoffs for the eighth consecutive year and earn a rematch with reigning state champion Lighthouse Christian in the first round of the eight-school playoffs, to be played in Twin Falls. Sawtooth North champion Dietrich (6-0, 3-0) is likely to host South runner-up Castleford (6-2) on the first week of the state playoffs. Last Friday, Lighthouse (7-1, winning by an average score of 50-15) posted its third shutout of the season 34-0 at home over Castleford. The Lions have won six straight since a 52-40 home loss to Grace Aug. 31, and will next travel to Arco for a big game against 1A Division 1 Butte County (5-2) this Friday. Extra point kicks: Garcia 1. Touchdown passes—Jordan Dilworth 13. Conversion passes—Jordan Dilworth 11. Notes—Carey has scored in 22 of 27 quarters....Carey has successfully made 23 of 40 conversions (58% success rate)....Carey has scored 41 TD—26 on runs from scrimmage, 13 on passes, 1 on defense, 1 on kickoff or punt returns.